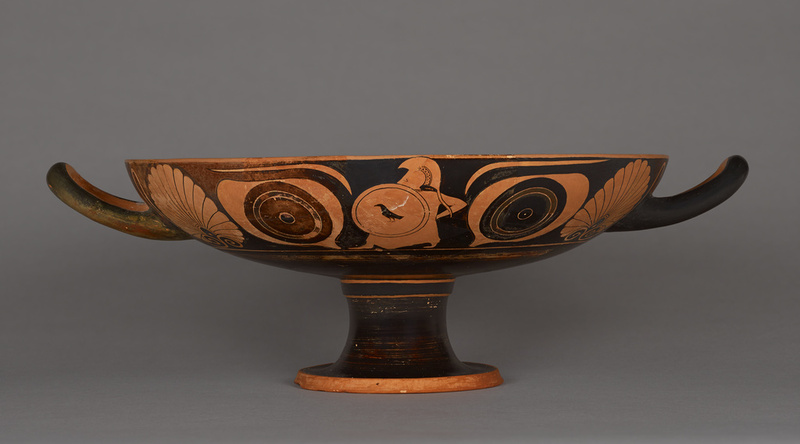 The cup is broken and restored, executed in both red and black figure techniques Interior: The interior decoration is mostly missing. 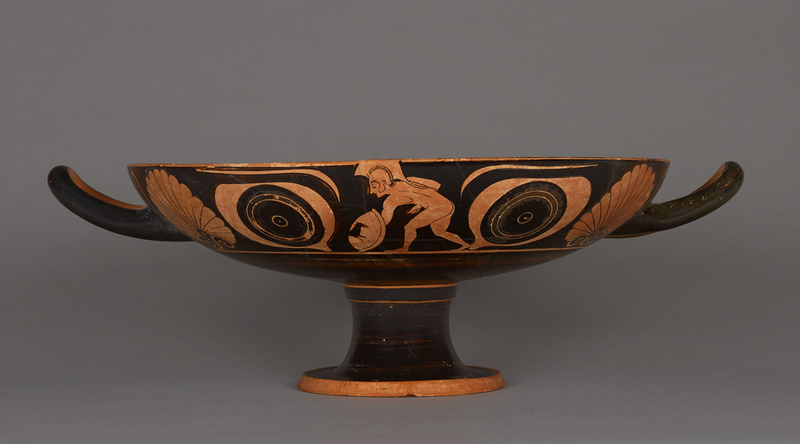 Preserved in the tondo, in black-figure, are the two feet and lower hem of a running figure, perhaps Dionysos, carrying a grapevine. Exterior: The exterior is executed in red-figure technique. 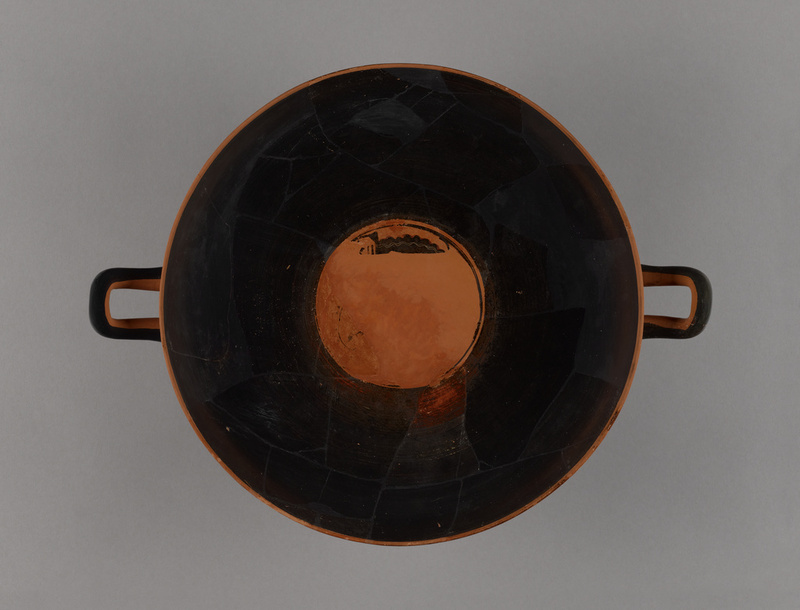 Side A shows, between the eyes, a helmeted hoplitodromos with a shield decorated with a raven device. Side B shows a crouching, helmeted hoplite between two eyes with a shield decorated with a horse device . Around the handles are large closed palmettes. Added red is used for the inner circles of the irises and the pupils of the eyes. Leon Lévy, 1926 - 2003, donated to the J. Paul Getty Museum, 1983. Galerie Gunter Puhze. Kunst der Antike, Katalog 2 (1980), p. 18, no. 128. "Acquisitions/1983." The J. Paul Getty Museum Journal 12 (1984), p. 244, no. 66. Kirsch, Eva. 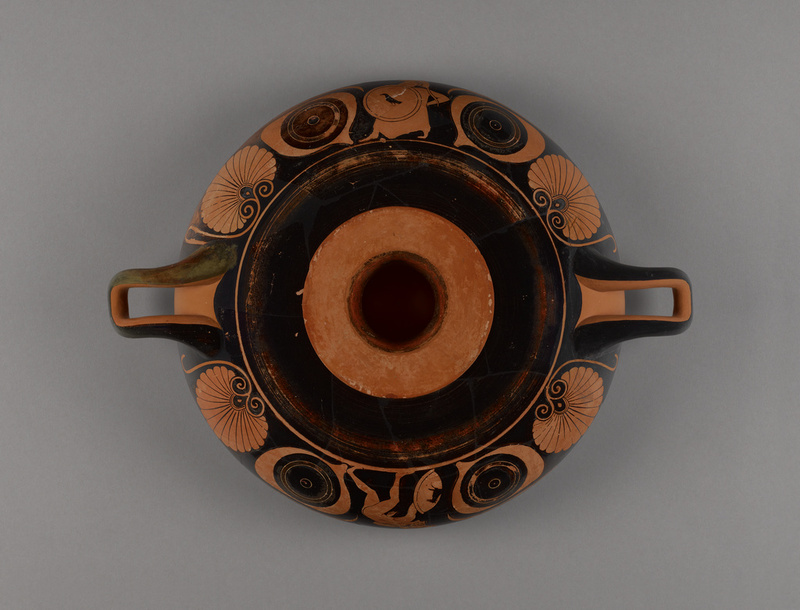 Greeks in the Boot: Greek Influences in the Italian Peninsula As Reflected in the Pottery of Various Regions, ca. 800-200 B.C., exh. cat. (San Bernardino: California State University San Bernardino, Robert and Frances Fullerton Museum of Art, 2014), Red Figure Technique, entry 4, ill.